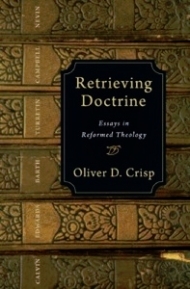 In this volume, Receiving Doctrine: Essays in Reformed Theology, Oliver Crisp offers a set of essays that analyze the significance and contribution of several great thinkers in the Reformed tradition, ranging from John Calvin and Jonathan Edwards to Karl Barth. Crisp demonstrates how these thinkers navigated pressing theological issues in their historical settings and in what ways contemporary readers can draw important insights from the tradition relevant to current discussions. About the Author: Oliver was born in West London. He completed a foundation diploma in fine art at Wimbledon School of Art (1990-1991) before going to the University of Aberdeen for his BD in Systematic Theology and Church History. He went on to read for an MTh at Aberdeen (1998), and a PhD at King’s College, University of London, on the philosophical theology of Jonathan Edwards (2002). Oliver taught theology at the University of St. Andrews from 2002-2004. He was the Frederick J. Crosson Research Fellow at the Center for Philosophy of Religion, University of Notre Dame, USA (2004-2005), and has been a visiting lecturer at Regent College, Vancouver, BC (2005, 2007, 2008). He is the Secretary to the Society for the Study of Theology.